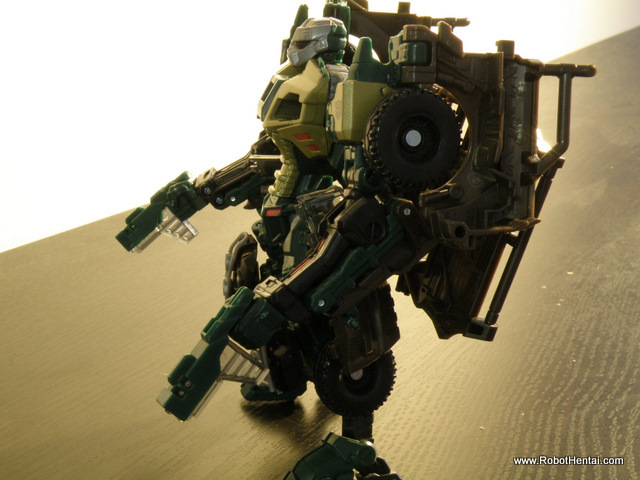 ROTF Brawn Review | Out of the box. 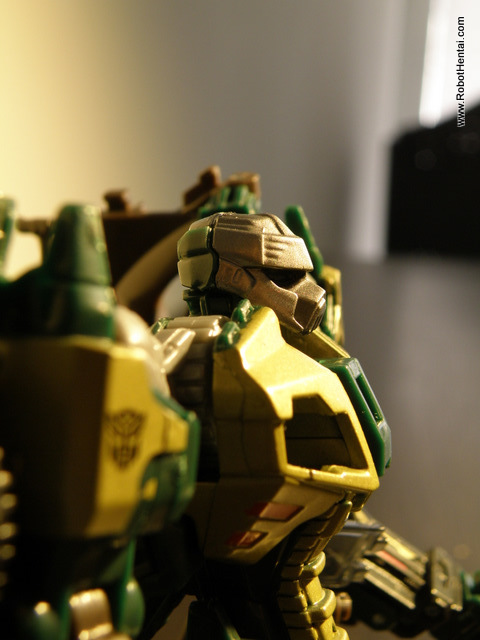 Brawn as far from my child hood memory is 1 of those Autobots that I would not pay any attention to it due to its association of weak and small bot. 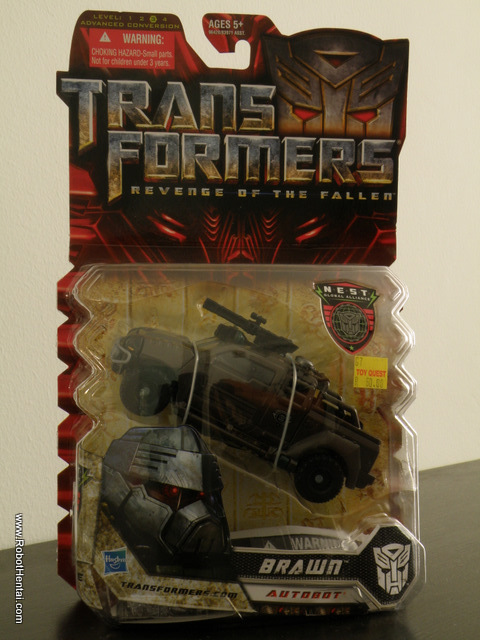 ROTF Brawn paperback plastic bubble package. 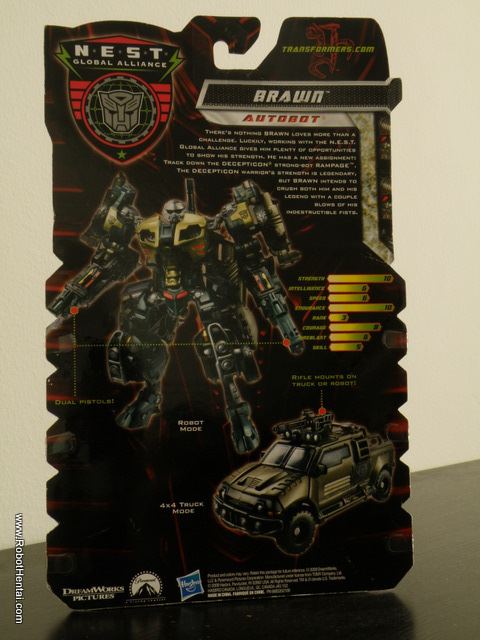 ROTF Brawn package back shows biodata as well as feature. 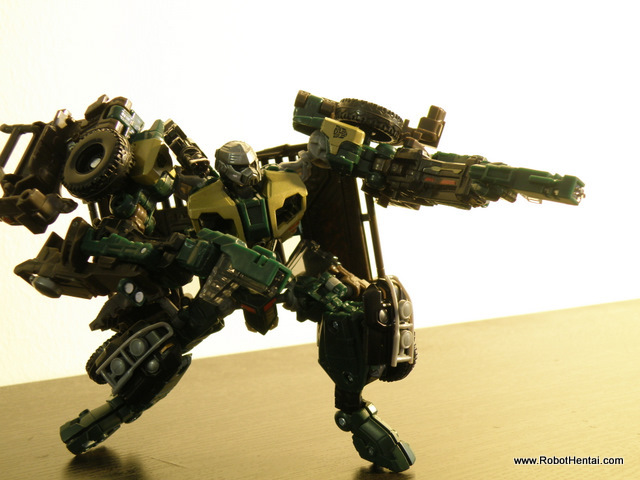 However the rendition of Brawn in ROTF styled robot had made my jaw dropped all thanks to my friend TCracker. 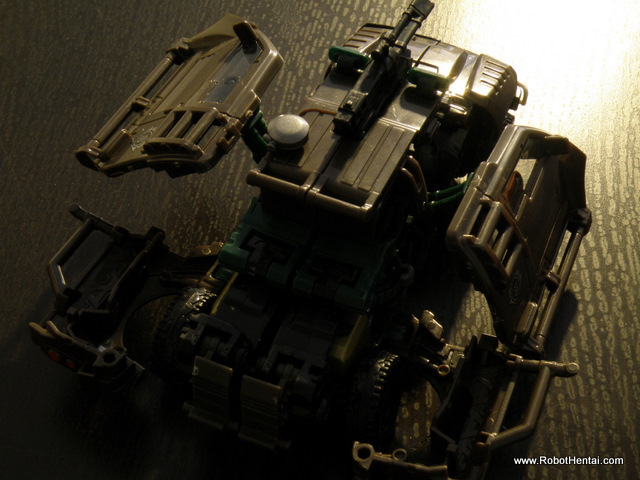 The robot mode is the reason that I sought to get this Autobot, we will explore the reason later. 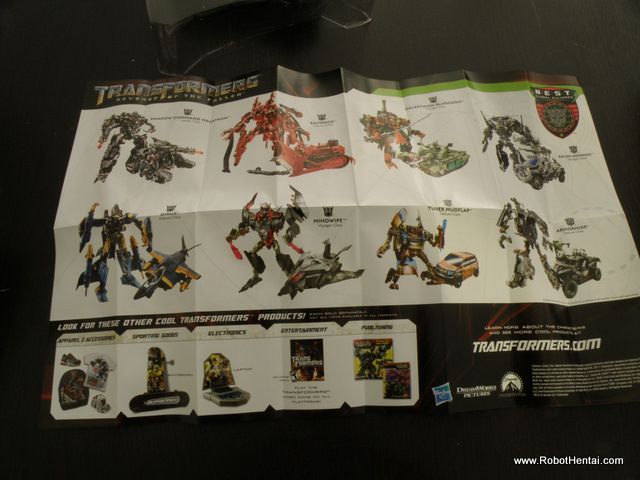 The package comes with the toy, transformation sheet and catalog of transformers toys. 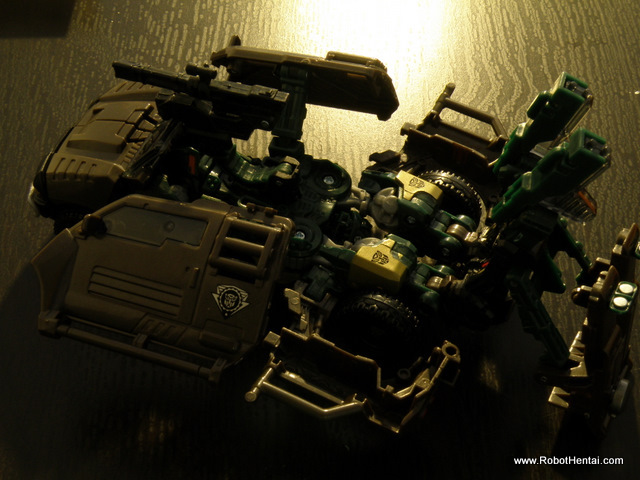 ROTF Brawn Transformation Instructions with non-attractive color. 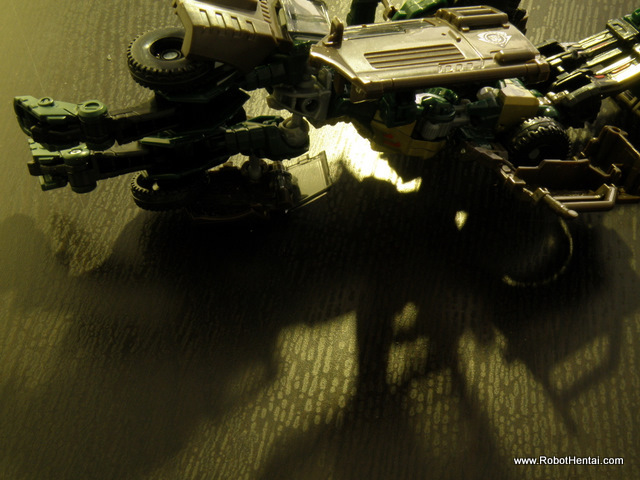 Continuing with Brawn. Out of the box, it is in Alternate mode. 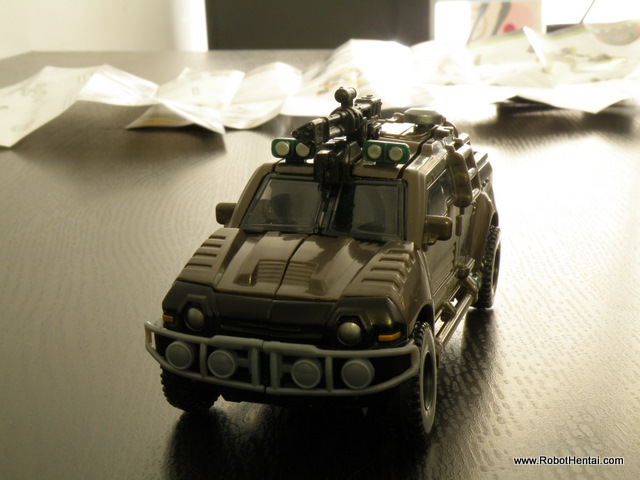 In its Alt Mode Brawn is just a normal looking military 4WD truck with a minigun mounted on its roof. All the wheels is workable but it is made from plastics. 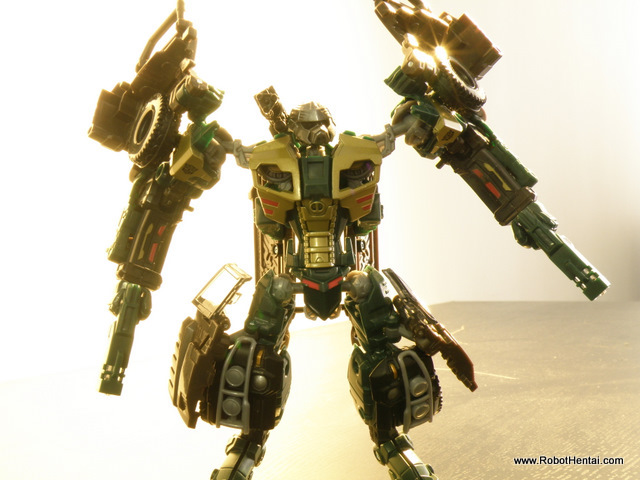 ROTF Brawn alternate mode with NEST logo at the side. 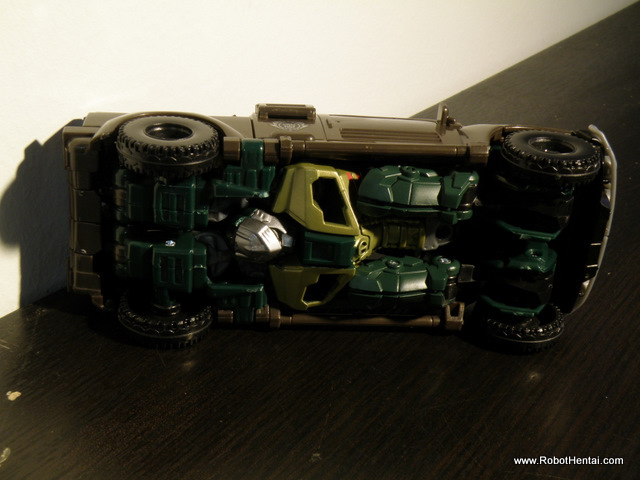 Too bad the doors as well as the windows of Brawn in truck mode is not functional. But the details of the truck is unmistakably beautiful. There is not a single part of the robot visible at the back. 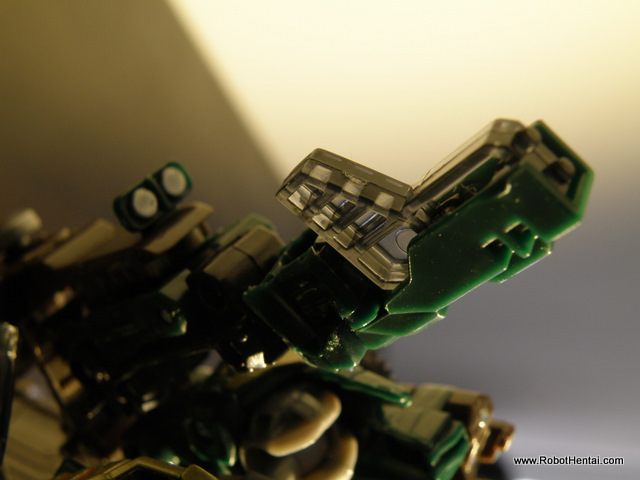 Unfortunately, the head and chest of Brawn can be seen from the bottom of the Alt Mode. 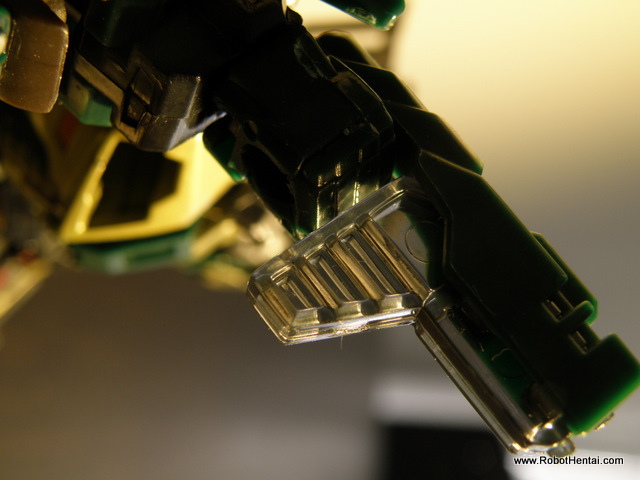 The robot head, chest as well as part of the feet is visible. 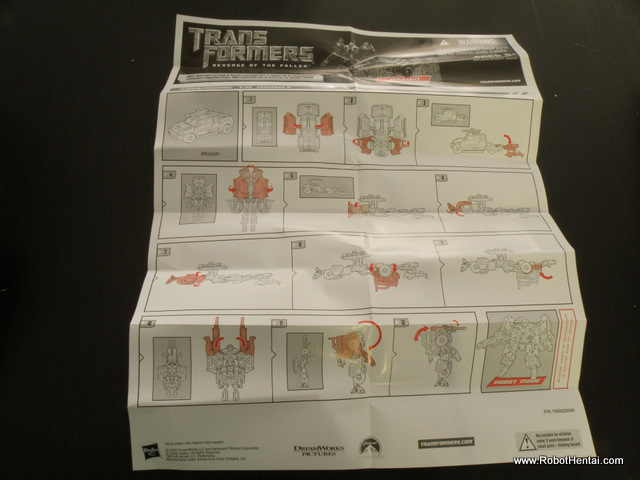 For transformation wise, like most figures of ROTF toyline even in Deluxe Class, the transformation can be considered as complicated compared to G1 Transformers. Due to the complexity of the transformation it seems that future toys are more worth the buck paid for its high tech design. 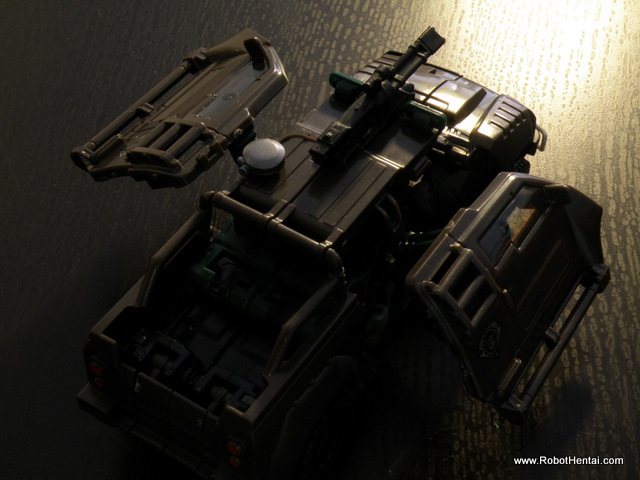 As a summary, the bonnet of the alternate mode is its legs and feets, the back of the truck is its arms, and the middle part is the body of the robot. First step is to unlock or open the main "lock". Open the back cover of the back wheel. Sway the roof to back of the truck. Splitting off the bonnet to expose leg and form leg armor. Tranformation of front truck to robot legs finally completed. Twisting the waist to front of the robot body. Fold down the part of the mud protector of the back wheels. 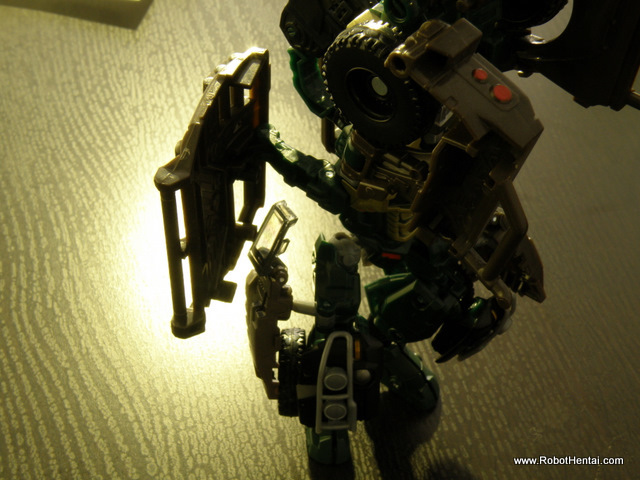 Moving the side plate of Alt Mode. 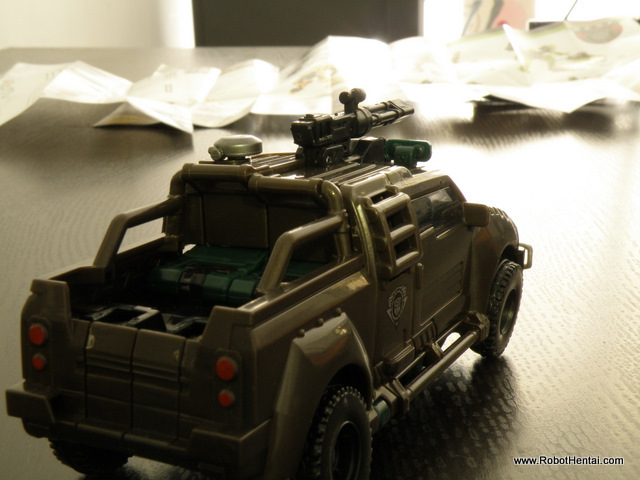 Folding of roof make form for Brawn arms. By twisting the shoulder and arms, will complete the transformation. 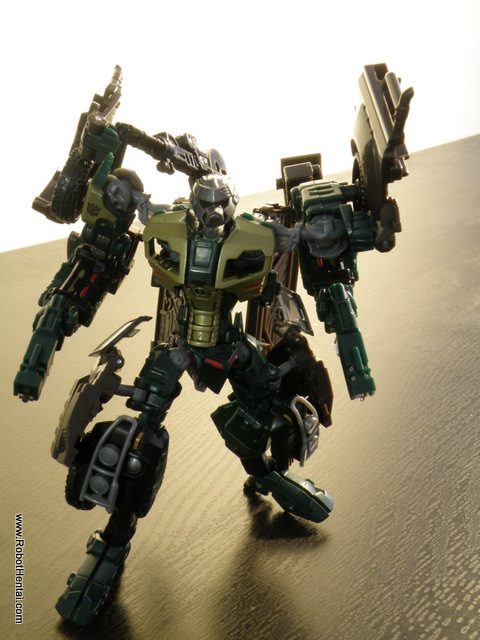 Once the transformation complete, ROTF Brawn looks very beefy at the top, with big and long arms. 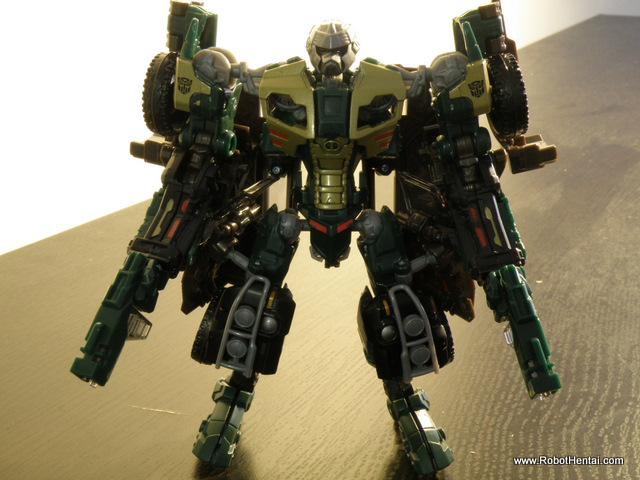 Top heavy ROTF Brawn Transformation complete. 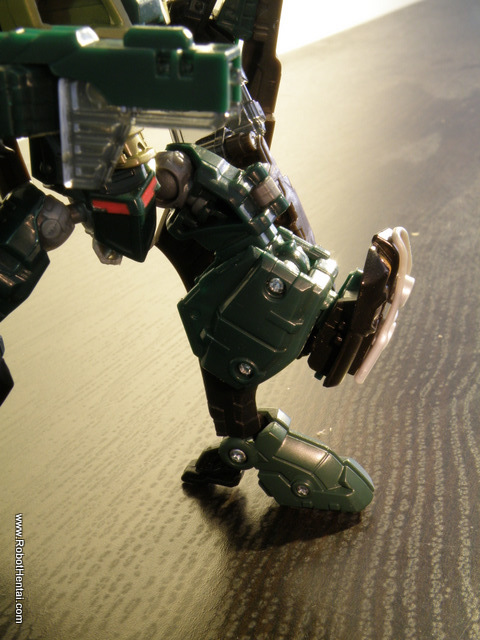 One of the complain discovered during the transformation is, the ball joint of the legs connecting to the body is loose. The joint pop out from the ball a few times during transformation. 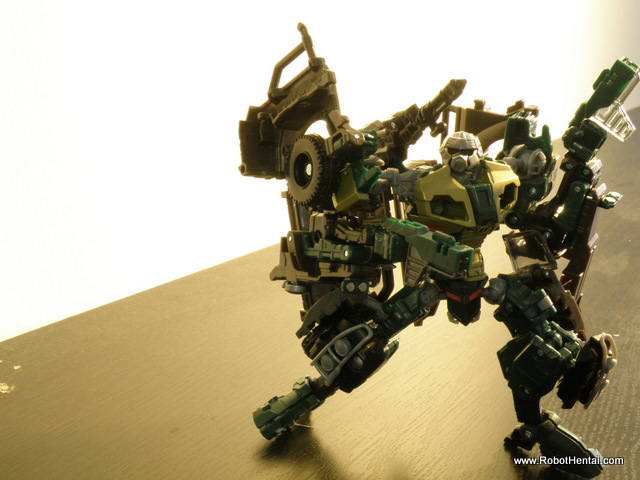 With the heavy top, it is quite a feat to strike a pose with ROTF Brawn. 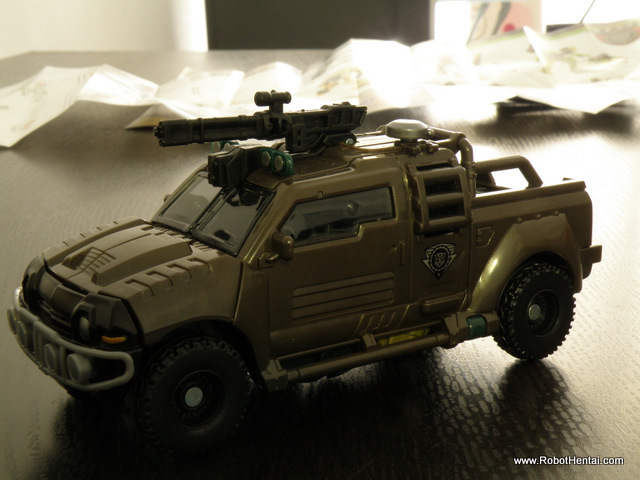 In term of sculpt and details, it is amazing for this Deluxe Class transformers figure. The only thing that is giving weight is its "cloak". The main cannon is stored in between the "cloak". 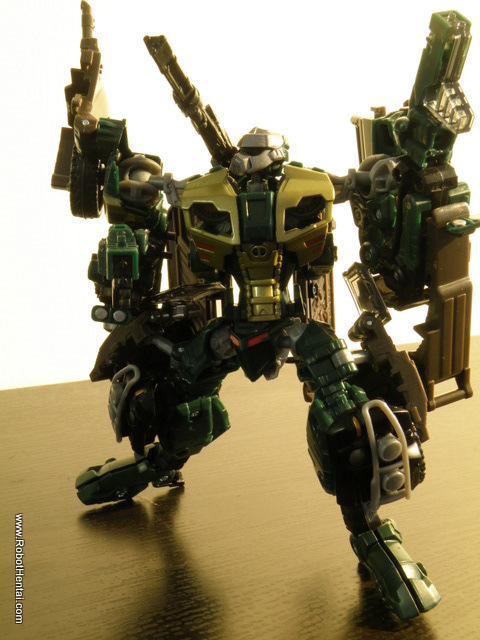 The next thing that worth mentioning is deployment of the main cannon to make Brawn looks like those highly stylized Japanese Mecha. 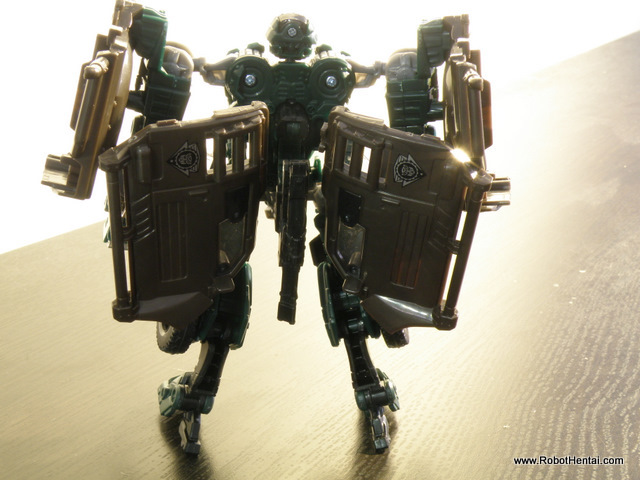 Lets have a closer looks to the robot mode. Darkened eyes but there are details. 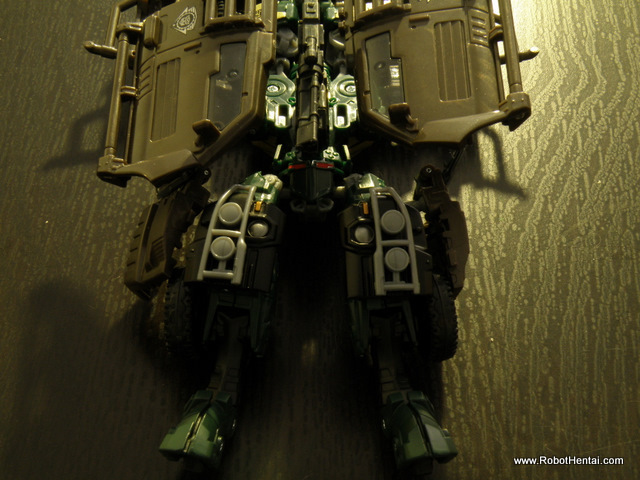 Another perspective of Brawn robot mode. 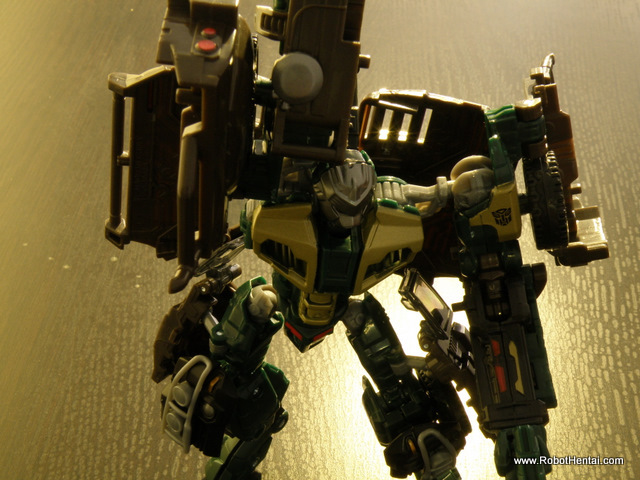 Expect no slack in giving details to Brawn's arms. 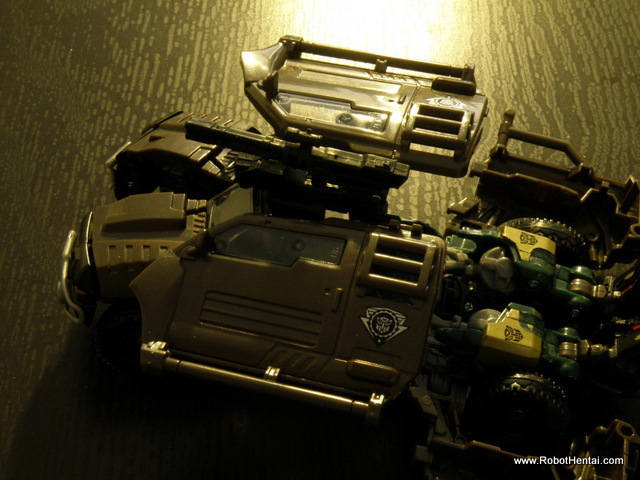 Bumper as knee, half bonnet as leg armor. On to review of deployment of the main cannon. Swivel up the cannon from original position. Unfold the barrel of the cannon. Make a full proper straightening of the cannon barrel to finish the deployment. 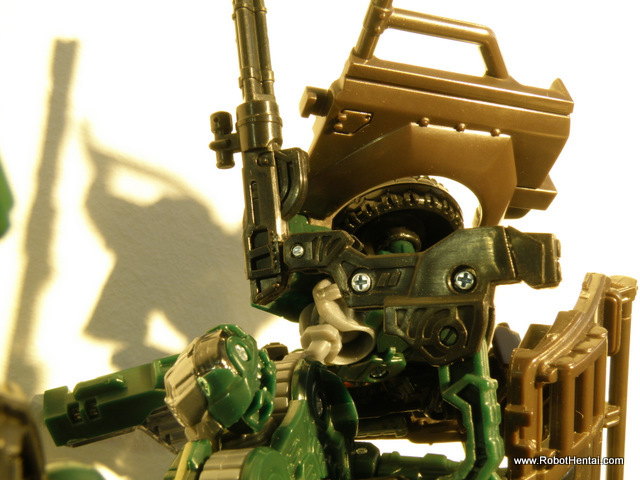 Once the canon is deployed, twist the root of the cannon which is attached to the back of Brawn the the left or right to make it a shoulder cannon. The only gripe is the cannon unable to be detached. 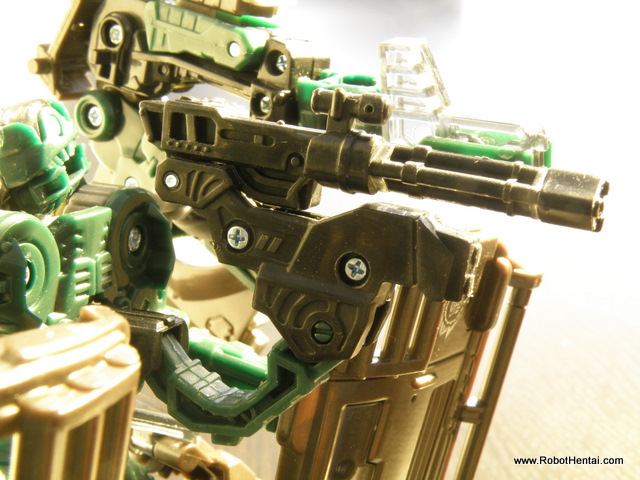 ROTF Brawn with full glory of its armaments. 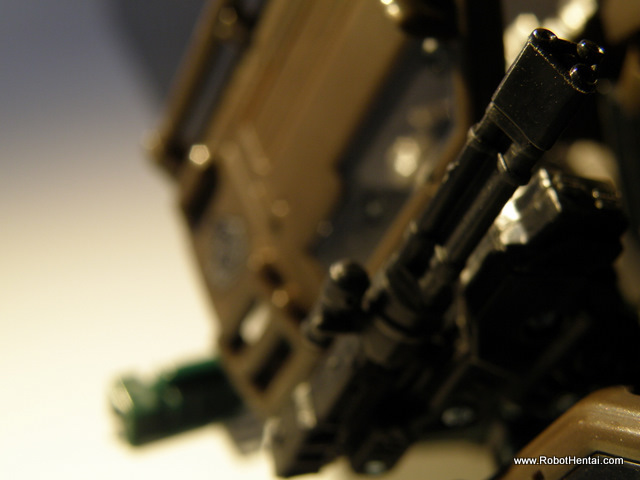 Now on towards the twin blaster of ROTF Brawn. 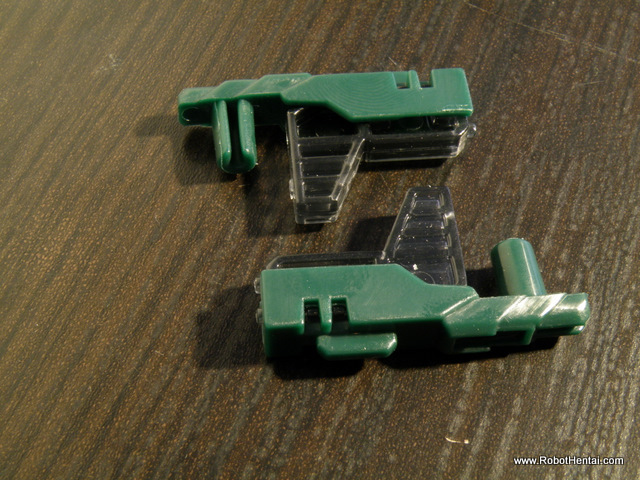 Each pistol is a mirror to the other with same design. Ventilation vents and blaster short barrel is added. So much the same and there is also difference. 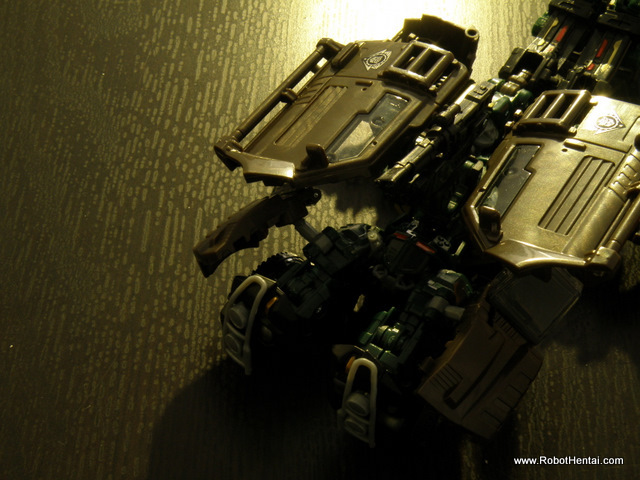 Next, articulation wise will leave the pictures to do justice for it. 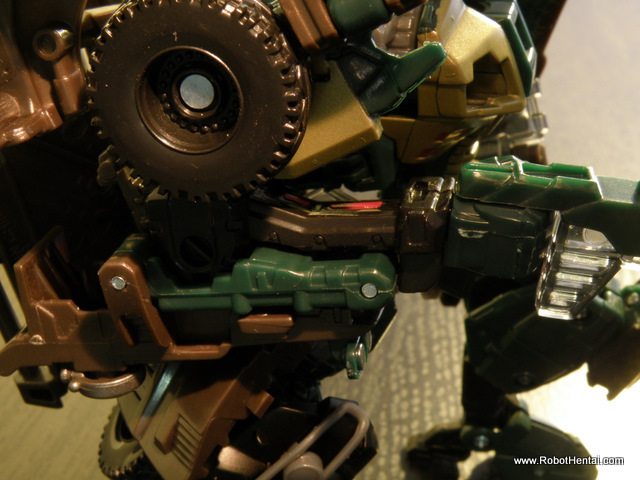 Just a note that the ball joints connecting the pelvic part and the legs is loose even for a new figure. Arms and Legs stretch out. Some random strike a pose before closing. 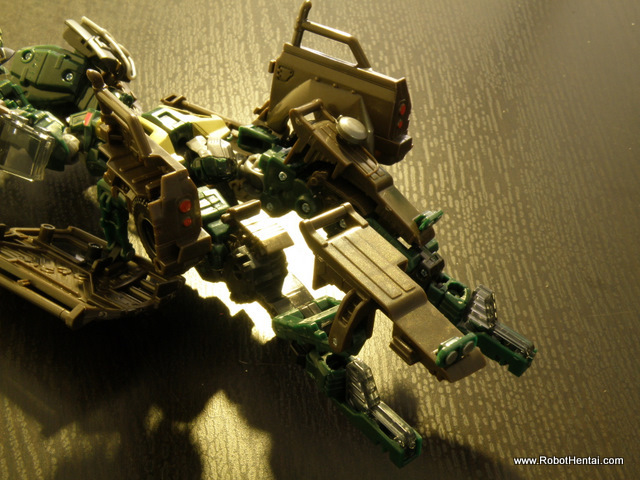 Robot Mode Brawn strike pose. 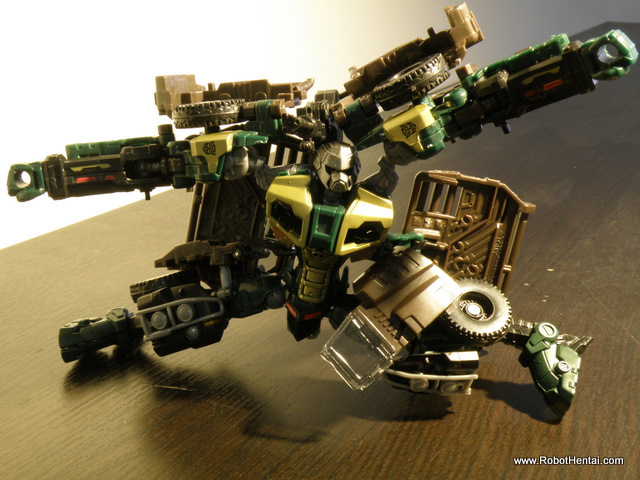 Gunfu inspired pose for ROTF Brawn. 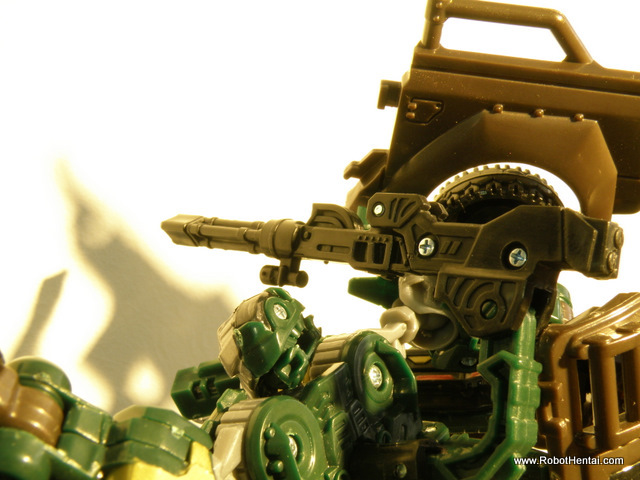 ROTF Brawn bracing for cannon to fire. 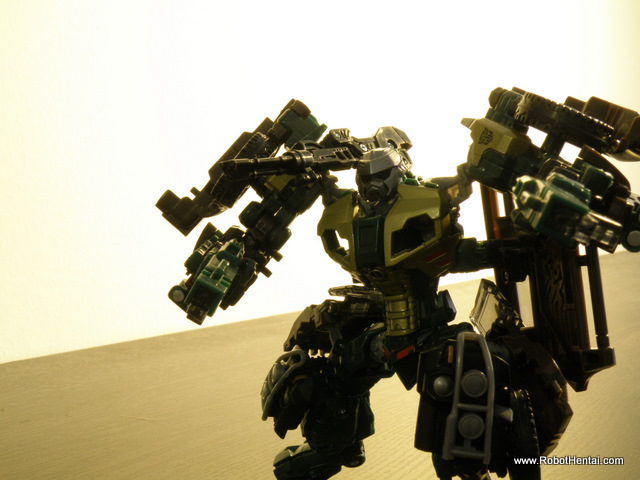 Brawn at front of a bright backdrop. 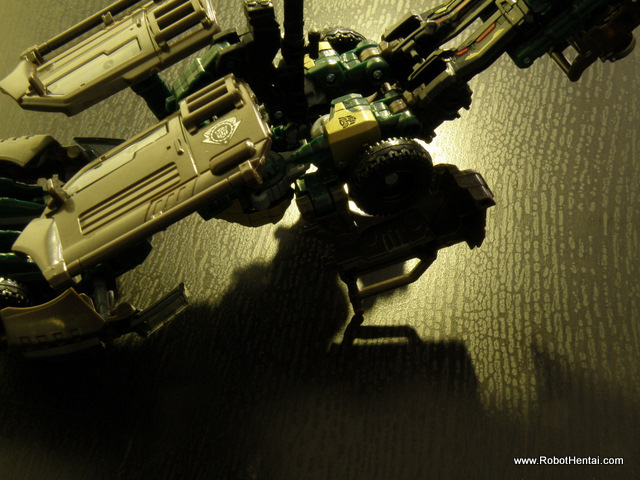 As a conclusion, ROTF is not without flaw such as kibble at the bottom view of the Alternate mode as well as poor loose joint to support heavy top robot mode. 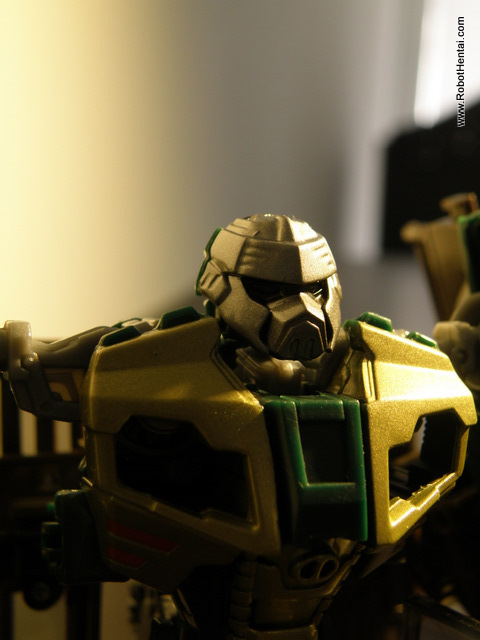 The detailed as well as Japanese mecha similarity is ROTF Brawn’s charming point for collectors. *Note : Finally able to squeeze time to update the blog. Do not worry as I will not abandon this blog. Also no cropping or white balancing. Just resizing and add water mark to the pictures to this post. Let's Dance Pose - TF Edition. 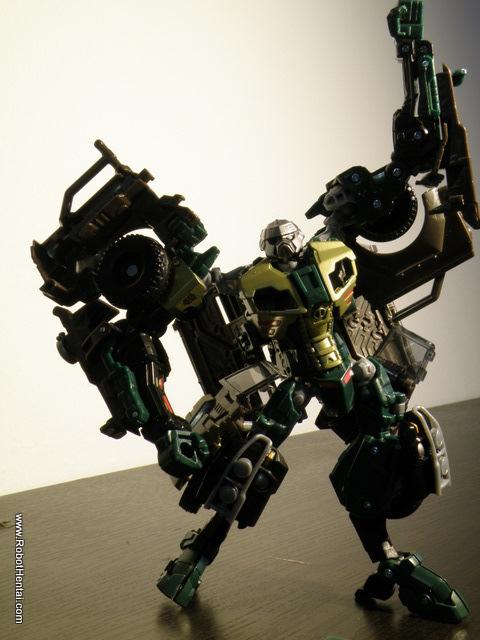 This entry was posted in My Hobbies, Transformers and tagged autobot, Brawn, Deluxe Class, ROTF, Transformers by KarMeng. Bookmark the permalink. those were amazing! how can i buy those one? I am not sure where can we get the figure other than ebay or other 2nd hand places.